Basic phone transfer upgrade to UDP line? Hey all here is my situation that I am looking for suggestions on how to go about getting it to work. 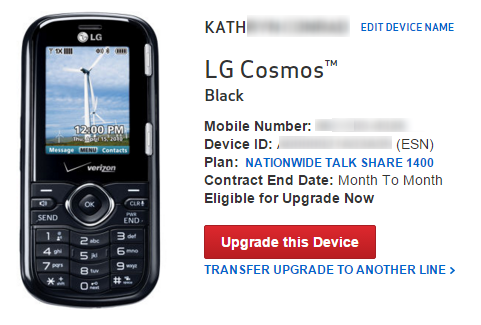 L1: Upgraded a year ago-ish using the method of buying the phone on the upgrade price and using the original SIM card in the phone once it arrived and throwing the SIM it came with away. UDP kept intact. L2: Upgraded a year ago-ish using the method of buying the phone on the upgrade price and using the original SIM card in the phone once it arrived and throwing the SIM it came with away. UDP kept intact. 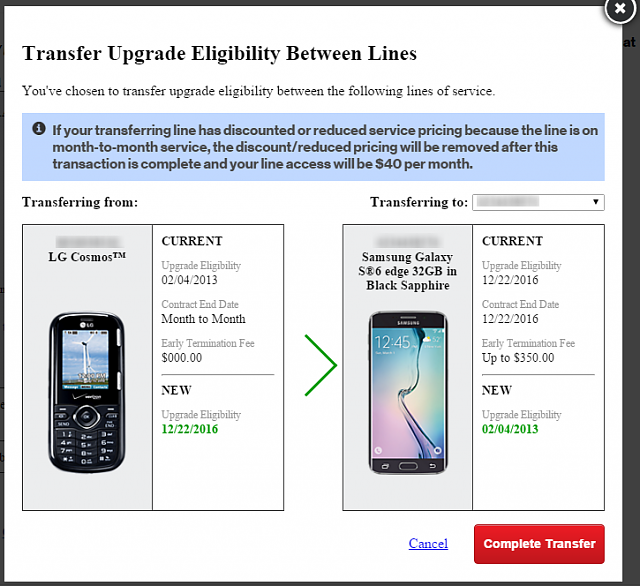 L3: Has been sitting unused for about 4 years now (paying $19/month for it to do so....). When I click the Transfer Upgrade to another line I get the chose to choose my line (L2). So I again click on the link Transfer Upgrade to Another Line When i click that i get whats in after selecting my phone line (L2) for the upgrade to go to. Then I am presented with the page. It shows L3's upgrade being given to L3 as I selected and wanted. So i check Upgrade Available checkbox for L2 and continue. 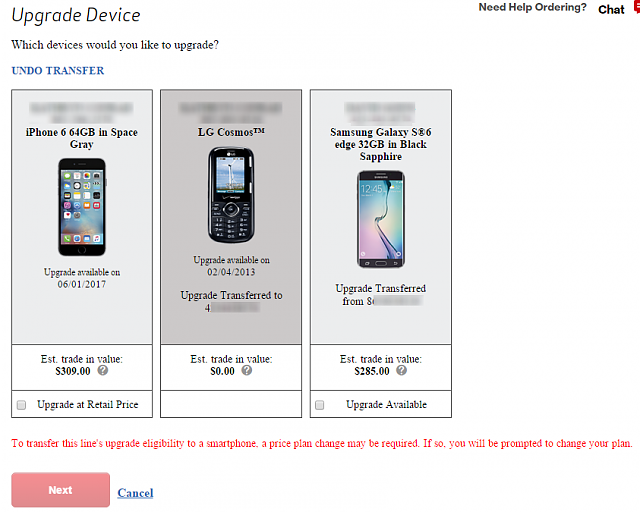 Then I am presented with selecting a phone for the transferred upgrade to L2. 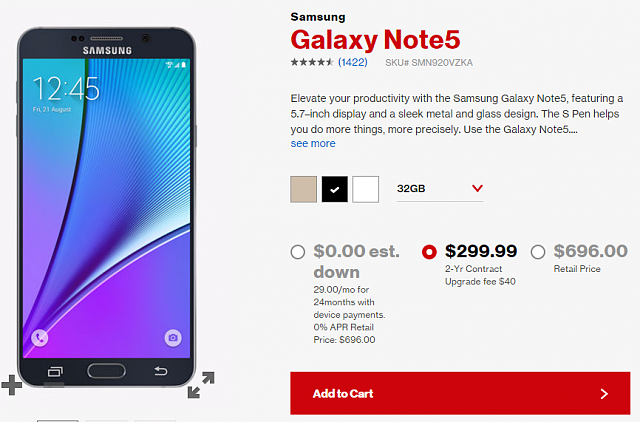 I choose the Samsung Note 5 32GB black model and also select the 2-year $299 with upgrade fee $40 option as seen in image. I proceed to add that to the cart. 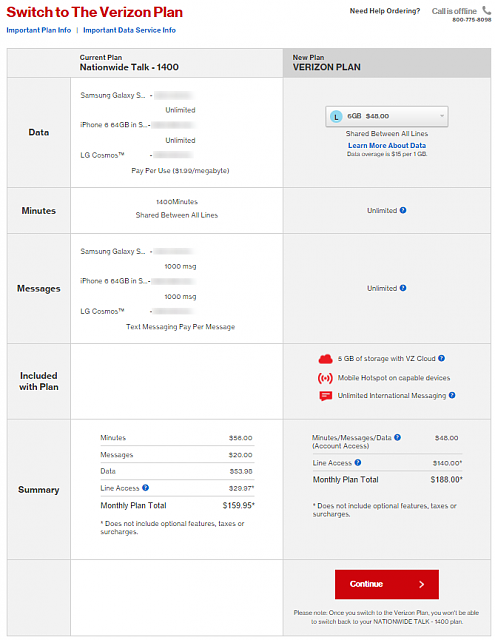 I am then presented with a "confirm pricing" page as seen in the image. This again shows that its being applied to the L2 line (which again is what I want). So i then continue. The next step just asks if i want protection on the new phone. I choose Total Equipment Coverage and just continue on. Then I am presented with where I am stuck and the main reason why I am posting in this forum. 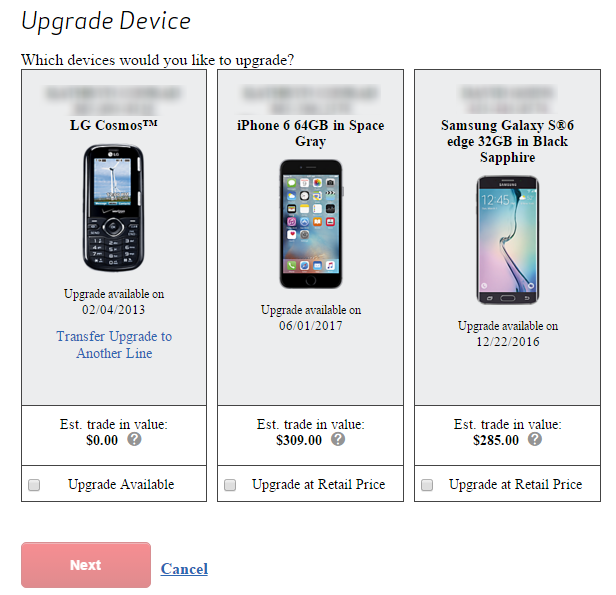 It asks me to select a new plan for the upgrade as seen in the image. This is where I am stuck now. To me it looks like its taking that upgrade and applying it to L3? I'm not going to click the continue button since below that it tells me that Please note: Once you switch to the Verizon Plan, you won't be able to switch back to your NATIONWIDE TALK - 1400 plan.. So again, that is why I am posting here in hopes someone has a similar situation that I do and has a solution to it! How do I regain internet on my LG-E612? Is it possible to restore contacts after a factory reset without paying for a program online? S4 won't connect to my wifi but my computer will. I have tried everything. What can I do? How do I un-root a Samsung S765c? How do I transfer contacts and texts from my Lumia 1520 to Galaxy S6 Active?